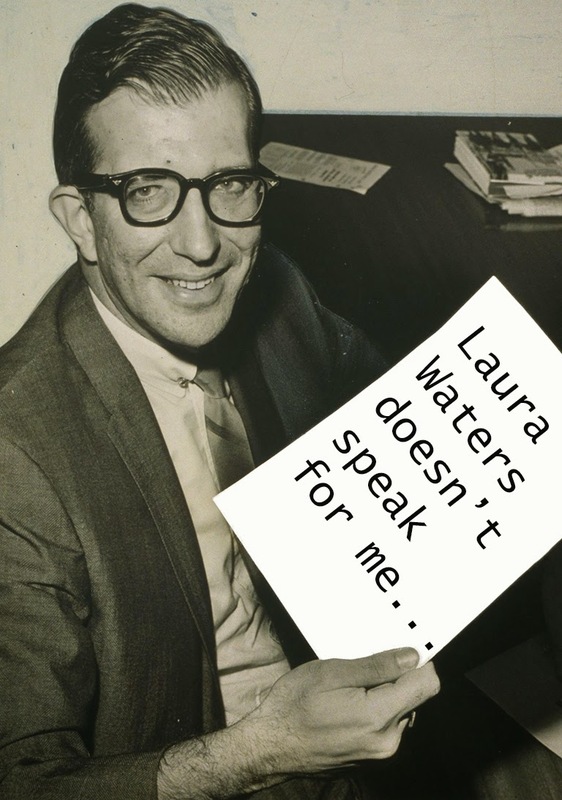 Once again, WHYY contributor Laura Waters has invoked the late Albert Shanker to strengthen her weak argument, this time in an attempt to imply that the Delran Education Association didn't do their homework before releasing their position statement on high-stakes testing. She even goes so far as to call their statement a "screed" that "veers less towards serious educational discussion and more towards Sarah Palin-esque hysteria." She better have a seriously well documented refutation of their positions to make a statement like that. Let's look at the one where she cites Shanker as her source. Waters defends the report and supports her claim that it was widely considered a "pivotal moment by all those who value educational improvement" by highlighting Albert Shanker's early support. Actually, the publication of "A Nation at Risk" is widely hailed as a pivotal moment by all those who value educational improvement. The Report famously articulated a "rising tide of mediocrity that threatens our very future as a Nation and a people" and was embraced by America's most famous unionist, Albert Shanker. According to former AFT President Sandra Feldman, "when Al finished reading the report, he closed the book and looked up at all of us and said, 'the report is right, and not only that, we should say that before our members.'" While it is true that Shanker embraced "A Nation at Risk", he was also clear about what he did NOT embrace. Diane Ravitch made it clear that although Shanker supported the report in 1983, his present feelings about it and all it has come to represent may be entirely different. 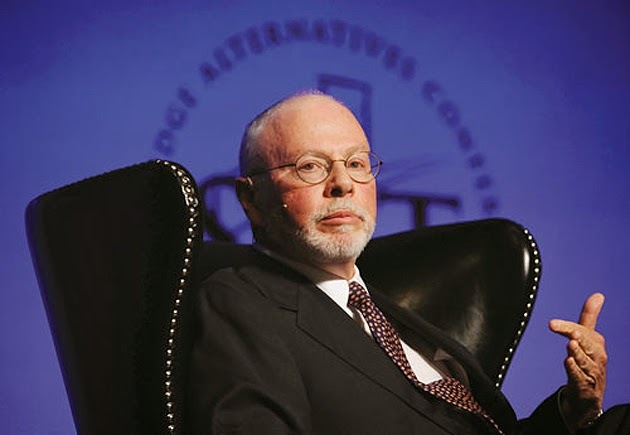 Would he be as enthusiastic about “A Nation at Risk” in 2013 as he was in 1983, now that it has become the Bible of the privatization movement? We don’t know. However, I can speculate too. Al Shanker cared passionately about a content-rich curriculum. So do I. Would his love for a content-rich curriculum have caused him to join with those who want to destroy public education? I don’t think so. Would he have come to realize that “A Nation at Risk” would become not a document for reform but an indictment against public education? If he had, he would have turned against it. Now, you may be asking, why should we give credence to Diane's hypothesis as to how Shanker would feel about A Nation at Risk were he alive today? Back in July of 2012 then NJ Commissioner Chris Cerf tried to make his case for charters by stating that Shanker was "one of the first advocates for public charter schools." Diane Ravitch proceeded to give Cerf a bit of a history lesson, and clarified that in 1993 when Shanker saw that charters were being used to privatize public education, he turned against them. In response to Diane's post, Waters attempted to "school" her in an earlier essay for WHYY that stated "as a fact" that "(i)f Albert Shanker were alive today, he'd still be an education reformer and would support NJ's efforts to expand school choice for poor urban students." Jersey Jazzman took umbrage with Waters' commentary, and Diane picked up on his post almost immediately. I responded as well, but I used the words of Shanker's widow Edith, who has been quite outspoken about the fact that corporate reformers have no place using Shanker's name or positions on issues to defend the privatization movement. She had written an eloquent dissection of Joel Klein and his attempts to use Shanker's early support for charters to defend his own policies and actions. Diane picked up on my post, which ultimately got the attention of Shanker's daughter, Jennie. Jennie was clearly not pleased that her father's name and legacy was being usurped once again to defend the privatization movement. She stated very plainly, in a comment on Waters' original essay, that Shanker's heir apparent, if he has one, is Diane, NOT Ms. Waters. Your appreciation for my father's work and vision was lovely to read. But your stance on this issue is diametrically opposed to his values and intent, and you are dead wrong to shame Diane Ravitch for her position. Indeed, if you consider your thinking to be in line with my father's, I recommend that you champion her work, as my family does. If anyone can speak for my father in this day and age, the person who should be most trusted is Dr. Ravitch. What I really love is that Waters' most recent piece was meant to shame the Delran Education Association (much as she had attempted to shame Diane Ravitch) for not "doing their homework" before they wrote their position statement. Seems Ms. Waters, even after having been schooled by me, Jersey Jazzman, Diane Ravitch, and Shanker's wife and daughter, has a lesson or two to learn herself about invoking the name of Albert Shanker in the name of modern day education reform. Which brings me back to Diane's question in her post about Shanker and "A Nation at Risk." But based on the above, we can be pretty sure that Diane has a better handle on how he would feel about it today than Waters. And I think it's fair to extrapolate further and say that rest of the "lessons" Waters attempts to impart upon the Delran Education Association carry about as much weight as her insights regarding Shanker and "A Nation at Risk." As the Partnership for Assessment of Readiness for College and Career (PARCC) tests loom ever nearer, more and more concerns are starting to surface from New Jersey parents and teachers about the new testing regime, and what it will mean for students. New Jersey education blogger Sarah Blaine has been shredding PARCC, Pearson, Acting Commissioner Hespe and Arne Duncan, not just on her own awesome blog, Parenting the Core, but on Valerie Strauss' The Answer Sheet as well. 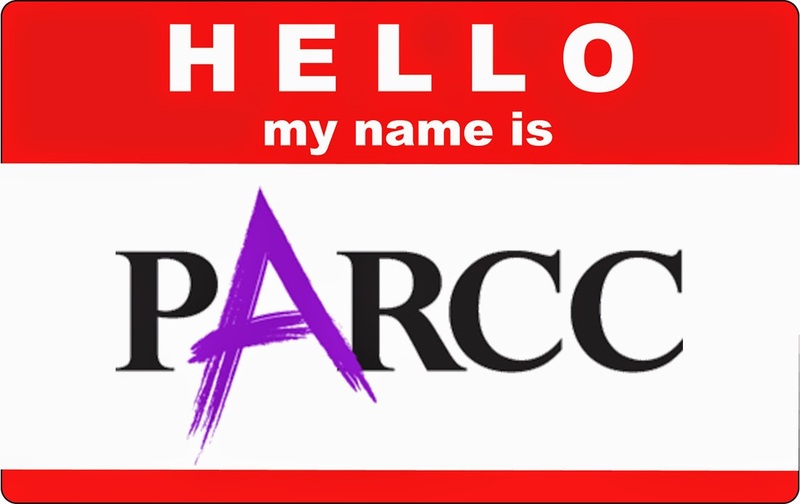 "Take the PARCC" events have been scheduled around the state to give parents a truer sense of the tests. You can take the PARCC sample questions for a test drive here. Districts have dropped mid terms and finals to try to recoup some of the time lost to PARCC testing. Many are concerned about Acting Commissioner Hespe's pronouncement that PARCC tests will be used as a graduation requirement, starting with the class of 2016. Keeping all of this in mind, I wasn't surprised when an academic high school teacher reached out to me about the havoc PARCC tests were wreaking in a large, suburban New Jersey district. But even I have to admit, I was surprised to learn just how much impact the PARCC will have, and how much time it will take away from genuine opportunities for learning. I think you will be too, so here is the teacher's story. It's a bit startling to truly understand how these new exams will impact learning. We were expecting the PARCC testing to disrupt our schedules, but the magnitude of it is beyond comprehension. The High School Proficiency Assessments (HSPA) test required three days of delayed openings. The PARCC will require 15... fifteen... days of two and a half hours delayed openings. Our regular classes are cut from 40 to 25 minutes, including lunch periods. The chaos which will result from this is beyond fathomable. There is no way this will not result in material having to be cut from the curriculum, or watered down to nothing. The Advanced Placement exams will arrive in May no matter what. The students will have to learn much of the material outside of class. There is simply no alternative. The students who come from or go to the vo-tech schools for part of the day will be living in constant chaos. Many science labs will not be able to be performed in the short amount of time available. The library will be used for testing and for make up testing, making it and the librarians moot for the better part of two months. The buses will have to run twice in the morning, first to bring the students taking a PARCC test that day, then those who aren’t, all at great cost. With only 25 minutes there will be no point in having students change for phys. ed., so that entire department will basically be shut down. How this all will affect teachers who move between schools or in other situations remains to be seen. We’re used to dealing with unusual situations for a day or two on occasion but for half a month? It’s going to cause major negative effects long term. Some good teachers are talking about quitting over this. They're supposed to be educators, not proctors for other people's exams. This story is not unique to a single district. When this is all over, there are the AP tests… ten days, and the Biology Competency tests… 2 days. I’m just not sure that there is going to be anything covered next semester to put on a final exam. One Newark must end and Tom Moran must stop writing about things he doesn't understand. I am so proud of my fellow NJ education bloggers Teacherbiz, Jersey Jazzman﻿ and Marie Corfield. With their "combined total of seven degrees, a PhD in the works, and 38 years of teaching experience" they collaborated to do what teachers sometimes must do - educate a resistant pupil - this time in the form of the Star Ledger's Tom Moran. As Jersey Jazzman says, he's ignored them individually, perhaps he will listen to them collectively. 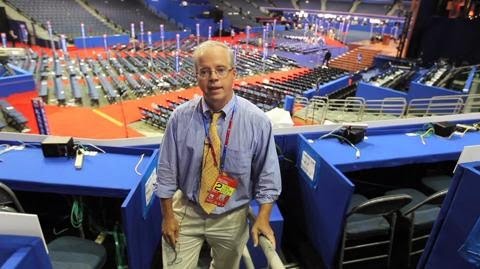 It's hard to imagine even Moran believes what he writes about Newark anymore. The One Newark plan is in shambles, and by Moran's own admission Anderson has little political acumen and virtually no support. The only thing keeping the badly botched plan afloat is Christie's ham fisted state control of Newark, which makes him the decider, no matter what the people, or their democratically elected mayor, want. Mr. Moran, please take note. 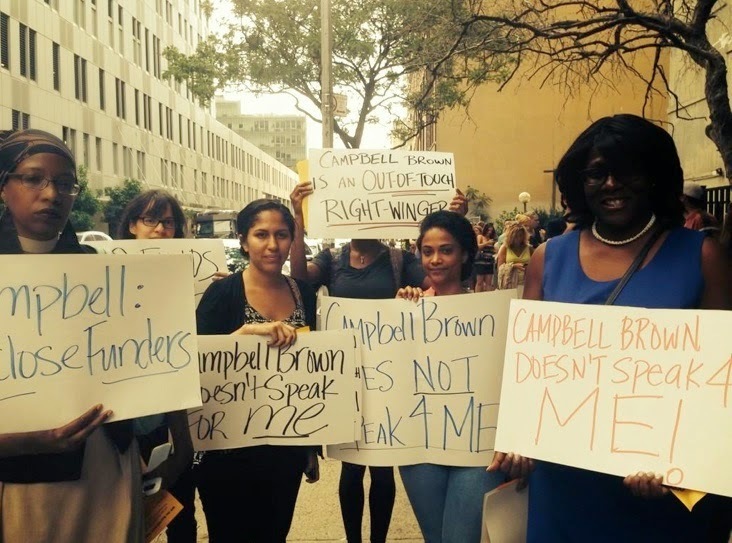 There is no more support for your opinions about One Newark than there is for the plan itself. Your transparent attempt to shower the blame for the inevitable failure of the plan on everyone from the mayor to the "conspiracy theorists" was about as low as it gets. You sir supported Christie's reelection. You sir supported Cami Anderson every step of the way. You sir opposed Ras Baraka's election. You sir denigrated the people of Newark and their elected Board of Education. If One Newark fails sir, you must stand and answer to the people of Newark, and you must do it alone. Christie's relentless quest to marginalize the people of Newark and privatize their schools is undeniable, and it's become quite clear he's not about to back down when he is on the brink of putting Newark public schools right where he wants them. Dear reader, if you want a real sense of what's happening in Newark, please read everything Bob Braun has written in the last two weeks. One Newark is a travesty, and that it is going largely unreported by the largest paper in the state is unspeakably deplorable. Diane Ravitch﻿ is helping Bob get the word out, bringing the people of Newark's plight to a national audience. Bob Braun is New Jersey’s Jeremiah. Outrage is his message. He will not be silent in the face of injustice. He will not curry favor with the powerful. He is angry. And, unlike those who are playing games with the lives of the children of Newark, his conscience is clear. And guess what Mr. Moran, the consciences of me and my fellow "conspiracy theorists" are clear as well. We stand on the side of children and parents and their right to democratically run their schools and decide their own fate. 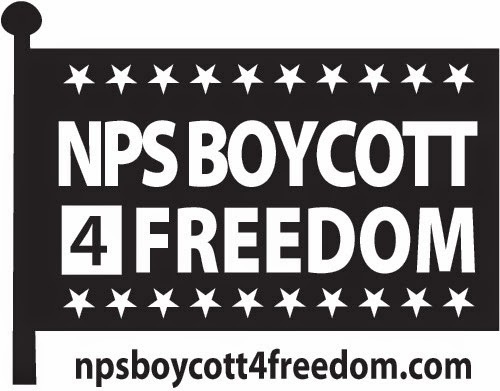 Readers, please do what you can to support the One Newark boycott. You can learn more, volunteer, and/or donate here. And a heart felt thank you to all of the organizers from me and my girls. If Cami Anderson gets away with her One Newark Plan, and we will not let her, because if she does it will be One Paterson, One Jersey City, One Montclair, One New Brunswick, One Perth Amboy, One Highland Park, One Princeton and we will not let that private mess happen all over this country. Despite what the Tom Morans of the world would have us believe, this is not just about Newark. Christie has no love for our community driven public schools, and he abhors the unions that work in them. We must all stand together to defend NJ's students, their schools and their teachers. Volunteer. Donate. Raise your voice. There is no program on the New Jersey education landscape as overpraised and underexamined as Interdistrict Choice. In contrast to the intense debate over other topics in education like charter schools, student testing, teacher evaluation, and the Common Core, rarely is anything critical said about Interdistrict Choice by politicians, activists, and education analysts/bloggers. Articles about this under-the-radar program are almost entirely laudatory and focus on the positive impact of Interdistrict Choice on receiving districts and Choice students, without any consideration of the financial impact on non-Choice districts whose state aid is siphoned away. In an era when 80% of NJ districts get less aid than they got before the recession and have had to accept painful budget cuts, there is very little discussion of how the exponentially increasing cost of the Interdistrict Choice program is a factor in aid stagnation. This is Part 1 of a two part guest blog series on New Jersey's Interdistrict Choice program. This first post will focus on Interdistrict Choice's budgetary impact on Choice districts, sending districts, and non-Choice districts. The second part will appear after the state releases more academic and demographic information on Interdistrict Choice and will evaluate the program’s enrollment patterns and academic impacts. Interdistrict Choice funding works by having state taxpayers assume 100% of the expenses for non-resident students to enroll in participating Choice districts. This amount is $10,500 on average in Choice Aid per student plus regular state aid and extra Transportation Aid for the sending district. The "Choice Aid" is equal to the receiving district's Local Fair Share, that is, roughly the amount that local taxpayers pay per child for their district's own resident children. Choice Aid varies by the wealth of the district. High-resource Choice districts that have high Local Fair Shares get as much as $15,000 in Choice Aid per Choice student. Lower-resource Choice districts that have low Local Fair Shares may get $3,000-$4,000 in Choice Aid per Choice student, but they get more in regular state aid for the same number of incoming students. However, since regular aid has been below-formula for the last few years, wealthier districts get more money than less wealthy ones. Prior to 2010 Interdistrict Choice was limited to one-district per county but not every county had a participating district. In 2010 the legislature, nearly unanimously, eliminated that rule. Since 2010 the program has grown from only fifteen districts to 136 for 2014-15. With that increase in district and student participation the amount of education aid diverted into Interdistrict Choice has grown exponentially, despite the recession and stagnant aid for non-Choice districts. In 2010-11 Interdistrict Choice cost $9.8 million, in 2011-12 it was $20.6 million, in 2012-13 it was $33 million, and in 2013-14 it was $49 million (for 4,682 students). For 2014-15 the Christie Administration put a 5% enrollment growth cap in place for existing Choice districts and limited space in new ones, so total cost growth for the new year will be only 10%, to $54 million. Choice money a district gets is completely independent of need and some of the biggest winners in Interdistrict Choice are the highest-resource districts in New Jersey. Deal, for instance, has an astronomically high $12 million in property valuation per student and gets over $11,500 in Choice Aid per student (both numbers used residential and Choice students for the denominators. Deal gets $1,000 per student in other aids as well.). Deal has six times the property wealth per student of Princeton and Millburn and yet it gets more state aid than Neptune Township and Long Branch, its Abbott neighbors, both of which get $7,000-$8,000 in aid per pupil. Most Choice districts are middle-resource, but half of NJ's Choice Aid goes to only fifteen districts (2013-14 numbers): Upper Freehold, Mine Hill, Pittsgrove, Englewood, Hoboken, Ocean City, Kenilworth, Deal, Hammonton, Morris Hills, Middle Township, Clinton Township, Central Regional, Hoboken, and Manchester Regional. Of the districts that get the majority of Choice Aid all except Hammonton, Upper Freehold, and Pittsgrove have over $1 million in property valuation per student. Hoboken and the Shore districts have more than $2 million per student. Nor are Choice districts, in any way, the neediest districts in terms of student population. Choice districts can be Choice districts because they have spare capacity, usually because of a shrinking student population. These districts, by definition, are not ones that have to grapple with residential student population growth and its attendant questions of how to pay more staff to educate more students, buy more computers, provide more classroom space etc. Although there are many fixed costs for a district with a dropping population, by definition, these districts don't have the most acute budget problems in New Jersey. Thus Interdistrict Choice is money for districts with the least pressing needs. Students who participate in Interdistrict Choice tend to be ones who are less expensive to educate. 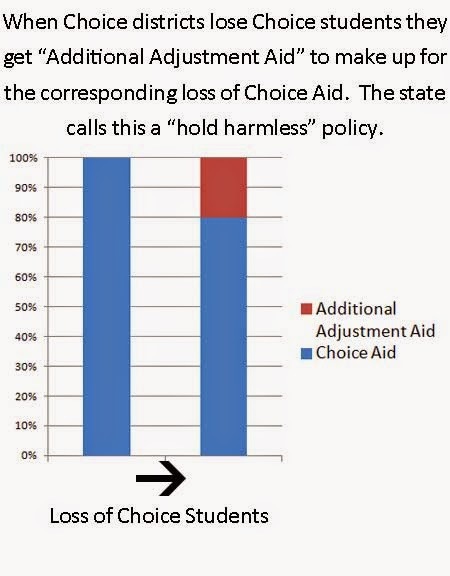 According to a Rutgers study done when Interdistrict Choice was in the pilot phase, Choice students are half as likely as the general population to have learning disabilities and the Interdistrict Choice legislation even gives Choice districts permission to reject students with special needs. Of the 105 Choice districts in 2013-14, 91 got Choice Aid that is equivalent to at least $100 per student, 51 got more than $500 per student, twenty-five get more than $1,000 per student, three got more than $5,000 per student. Deal’s $11,500 per student is the highest and allows Deal to finance over 40% of its budget with Choice Aid alone. Although Choice districts are paid, on average $10,500 for every Choice student they enroll, the net increase in their student population doesn't necessarily equal the number of students they take in, since a Choice district can also send its own students out to other Choice districts. 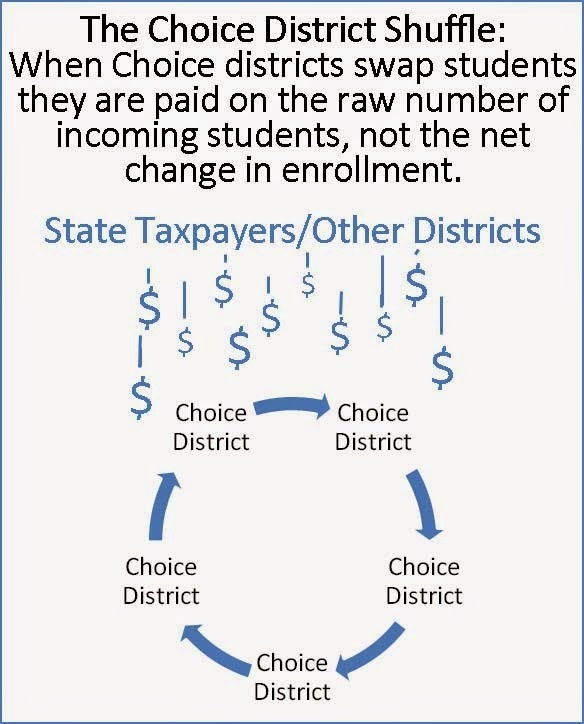 When Choice districts swap students they are still only paid for the raw number of incoming students, so that if a Choice district receives 20 students and has 20 students leave it is paid for another 20 students ($210,000, on average), even though its net change is zero. This policy has absurd implications for the awarding of state aid. For instance, since 2010-11 Cape May County districts have had a net decrease of 350 students, but despite the population decrease Cape May County districts receive an additional $7 million in state aid ($5.6 million of which comes from Interdistrict Choice). Between 2012-13 and 2013-14 West Cape May had a net loss of 22 students (from 97 to 75) and had a $178,000 increase in state aid because a higher proportion of West Cape May students were Choice students. Another absurdity is that Choice districts are (literally) paid for non-existent students. When Choice districts have decreases in their Choice student populations they receive as much aid as they got prior to the Choice student decrease, with the money now rechanneled through a peculiar aid stream known as "Additional Adjustment Aid." This practice means that Choice Aid spending is a one-way ratchet up; where Choice districts get more money when they take in more Choice students and they keep the money they got previously when they lose Choice students. For a Choice district, it's heads they win, tails they break even. In 2013-14 the calculation of Additional Adjustment Aid was very opaque, but Choice districts that lost students appear to have gotten a compensatory $600,000 in Additional Adjustment Aid. For 2014-15 the Additional Adjustment Aid is carried over in the same amount for all Choice districts, but other Choice districts that lost Choice students got another $1.8 million more in Additional Adjustment Aid. The bottom line is that state taxpayers are sending approximately $2.3 million in 2014-15 to Choice districts for non-existent Choice students. To be fair to Interdistrict Choice, since sending districts are supposed to lose regular state aid when they lose students to Interdistrict Choice, there are theoretical savings offsets for state taxpayers when children transfer out of a high-aid district into a low-aid one. If a child leaves Trenton (which gets almost $17,000 per student) and enrolls in Hopewell Valley (which gets $700 per student), the state would actually save $16,300 on regular state aid, an amount that is greater than the Choice Aid it would have to pay Hopewell Valley. The state would realize savings in the same way when children leave Asbury Park, Paterson etc. However, the aid difference between sending and receiving districts is rarely as large as it is between Trenton and Hopewell Valley. When students transfer between districts that are at rough parity in per pupil aid, like in the Hunterdon County and Cape May County Choice district clusters, the costs to the state are extremely high. The flip side of the state saving money through aid reductions is that if a high-aid district has many students who participate in Interdistrict Choice the sending district would have budget problems that are very similar to the problems districts have when students transfer to charter schools. The loss of state aid combined with the transportation subsidy most sending districts must give parents could potentially be very costly. In any case, for 2014-15 and 2013-14 school years the Christie Administration has had a policy of not allowing any district to lose aid. This means there are no savings offsets for state taxpayers. Choice Aid can be spent in any way a district wishes. It can be used to cut taxes, offset tax increases, offset budget cuts, or expand academic programming. The ways Choice districts use the money varies. Brooklawn, for instance, has not had a tax increase since 2001 and has let its per pupil funding become very low. At the other end is Englewood, which has used its Choice money to create the Academies@Englewood, a school-within-a-school with selective admissions and unique programming. Most Choice districts follow a middle path, using Choice money to offset tax increases and budget cuts, but not offering any special programming either. Choice Aid for New Jersey in 2014-15 is only $54 million. Even if you count Additional Adjustment Aid, extra transportation aid, and administrative costs, the program is still only a small portion of New Jersey’s overall $8 billion K-12 aid stream. Why protest? My answer is that New Jersey’s distribution of K-12 aid is already so unfair and irrational that even the diversion of less than $60 million should be scrutinized. The first unfairness is that there is a funding cliff between the Abbotts and low-resource non-Abbotts, where districts like Carteret and Belleville get one-quarter to one-third as much aid as Jersey City, Paterson, Elizabeth etc do, even though those districts need the money almost as badly. The Funding Cliff means that "Abbott Rim" districts have much lower spending and much higher taxes than the Abbotts that are nearly their economic peers. The second unfairness is that rural and exurban districts receive 2-3 times as much aid per pupil as their suburban peers do. For instance, West Orange has 6,926 students, of whom 36% qualify for Free and Reduced Lunch. Marlboro has 5,248 students, of whom 4% qualify for Free and Reduced Lunch. West Orange only has $860,000 in valuation per student, Marlboro has $1.3 million per student. West Orange’s per capita income is $43,000 a year. Marlboro’s is over $50,000. By logic, West Orange should receive more state aid than Marlboro since its students are poorer and its resources are smaller, but the opposite is true. Marlboro receives $11.5 million in aid, whereas West Orange receives $6.8 million. In light of the unfairness in the distribution of state aid, is it wise to create and support a program that takes money from the general K-12 aid budget and funnels it into districts that have lost population and thus do not have the most acute needs? Even if the Interdistrict Choice diversion is not as large a factor in causing districts to be underaided as the recession and the state pension crisis, Interdistrict Choice Aid stands out as one of the only factors within the control of the governor and legislature. For that reason the costs of Interdistrict Choice cannot be ignored as a factor in fixing New Jersey’s inadequate, irrational, and unfair distribution of aid. In theory Interdistrict Choice is a good idea. Who would object to giving students more choice over their educations? But the funding formula pays receiving districts way beyond the marginal cost of additional students and exists against a backdrop of severe underaiding in the suburbs and on the “Abbott Rim.” The state’s funding priority should be money for SFRA and low-aid districts (which may have growing residential enrollments). At the very least, Interdistrict Choice should be examined and scrutinized as other innovations in education are. If the program is to be preserved the absurdities of paying districts for non-existent students and based on the raw number of incoming Choice students must stop. The demographics of Choice students should be examined to determine if the full Local Fair Share payment is justified. If not, Interdistrict Choice is just another locked in privilege that benefits the few at the expense of the many. Jeffrey Bennett is a Board of Education member in Essex County. His opinions are not those of his Board of Education. It sure has been a busy week in education news in New Jersey. 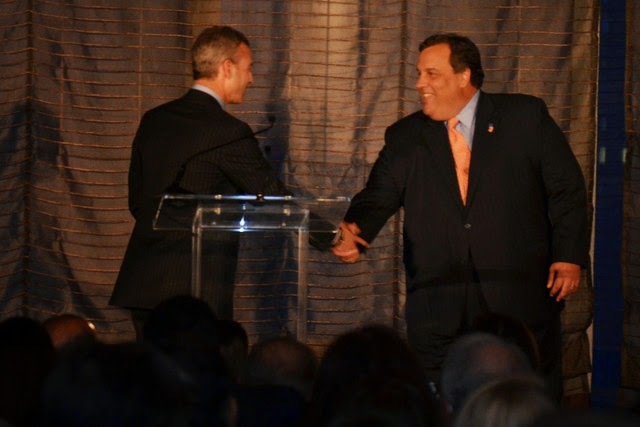 The education blogosphere has been burning up with posts about Governor Christie's executive order regarding PARCC and Common Core, here, here, here, and here. It's been covered in all the major news outlets too, and there was even a press release to explain how the DOE will implement the Executive Order. With all this chatter it's pretty likely that yesterday's press release about the five charters awarded their final charters, giving them the green light to open in September, will go all but unnoticed. The Star Ledger's Peggy McGlone covered it, but pretty much just regurgitated a few clips from the press release. Here are the five charters Commissioner Hespe has determined are worthy of your tax dollars. For now let's take a look at one in particular. I hope you'll forgive me, but the details surrounding the approval of the Atlantic City Community Charter School (ACCCS) had slipped my mind. Afterall, it's hard to keep track of a charter approved in January of 2011. Yes, you read that right, ACCCS was originally approved more than three years ago. ACCCS was one of 23 charters approved in one of Christie's blockbuster charter application rounds when he was still riding high on a wave of ed reform. Every year since then ACCCS has been given planning years. 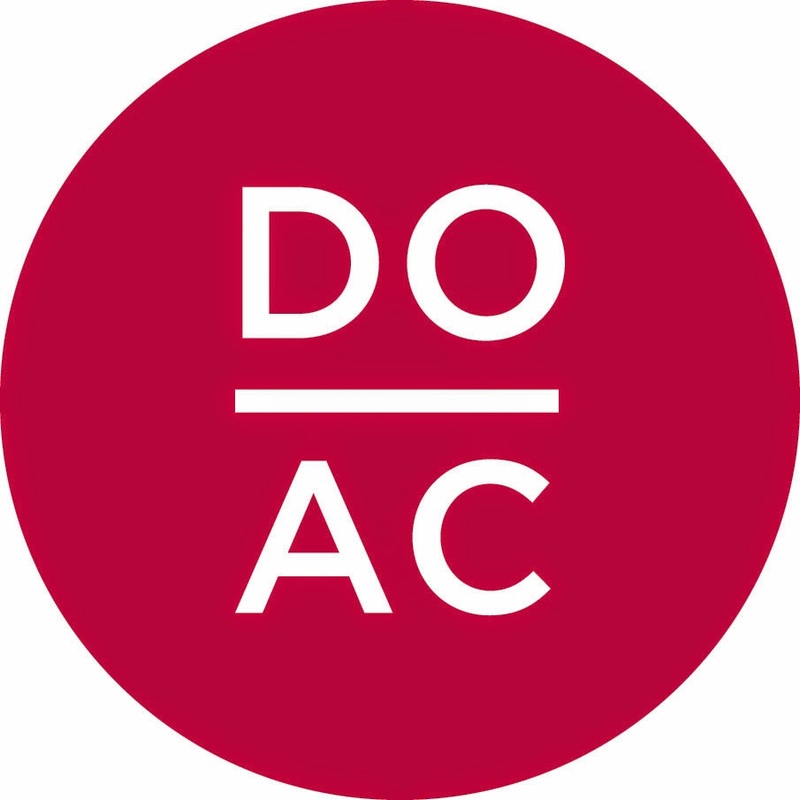 In July 2011 the DOE stated ACCCS and 20 other potential charters needed "additional time to plan and develop." In July 2012 ACCCS and 9 other charters "failed to demonstrate sufficient progress towards readiness." By July 2013 the DOE stopped reporting how many charter DIDN'T make the cut for final charters in their press release, but ACCCS was one of 8 not ready for prime time last year. Finally, it looks like 2014 is their year! Why did the NJDOE allow ACCCS to take not one, not two, but THREE planning years? Allow me to explain. In 2011 another charter was approved with a very similar name - Camden Community Charter School (CCCS). CCCS just completed its first year in operation. My good blogging buddy Jersey Jazzman wrote a few posts about CCCS before they opened their doors, and I wrote about them once too, specifically to highlight the for-profit CMO that manages CCCS. That would be none other than CSMI LLC, which also manages the Chester Community Charter School in Chester, PA. This excerpt from a September, 2013 Philly Inquirer article really tells you all you need to know about CSMI's business practices. CSMI, the firm that runs the Chester and Camden schools, is a for-profit company founded by Vahan Gureghian, a politically connected Gladwyne lawyer who donated more than $300,000 to Gov. Corbett's gubernatorial campaign and served on the education committee of his transition team. CSMI has fought to prevent public disclosure of its finances - including how much taxpayer money ultimately goes to company officials. The company has argued that, unlike public schools or some other charter schools, its finances are a "trade secret" or "confidential information," because CSMI is a private company managing a school, and not a school itself. In 2009, Gureghian attorney Edmond George - listed in public records as a founder of the Camden Community Charter School - sought to silence the Inquirer by asking a judge to order the paper to "refrain from public comments" about the company, the school or Gureghian. The motion was denied. In a separate matter, a CSMI lawyer tried unsuccessfully to bar a reporter from an arbitration hearing in open court. The school has sued the cash-strapped Chester Upland School District - which was in danger of shutting down last year due to lack of funding - for millions of dollars in disputed payments. The case was appealed up to the Supreme Court but eventually was settled out of court. Last month, in an audit report, state Auditor General Eugene DePasquale said the Chester charter school had improperly received nearly $1.3 million in state lease reimbursements - including payments for school buildings that had been owned by Gureghian. "It's like paying yourself for renting your own house," said DePasquale, who wants the school to return the money. DePasquale also criticized CSMI for what he called a lack of transparency. 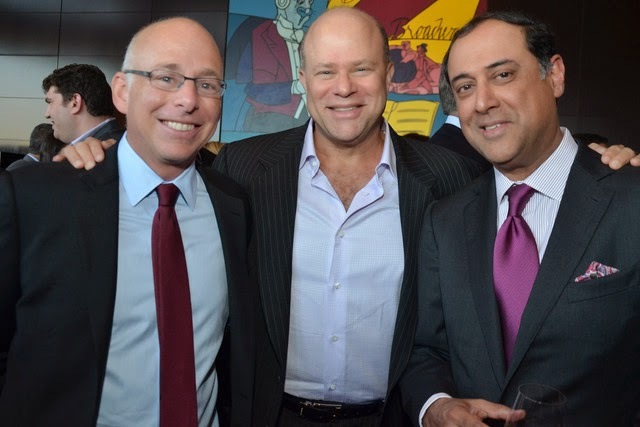 Clearly, CSMI plays serious hardball, and now this for-profit CMO has not one but two charters in NJ. Well, notice how the first part of that quote mentions that Gureghian donated $300,000 to Governor Corbett in PA? Gureghian has yet to throw that kind of money around in NJ, but the money has certainly started flowing. Jersey Jazzman pointed out that in 2013 Gureghian's money fed the Democratic machine in the southern part of New Jersey. But guess what else? 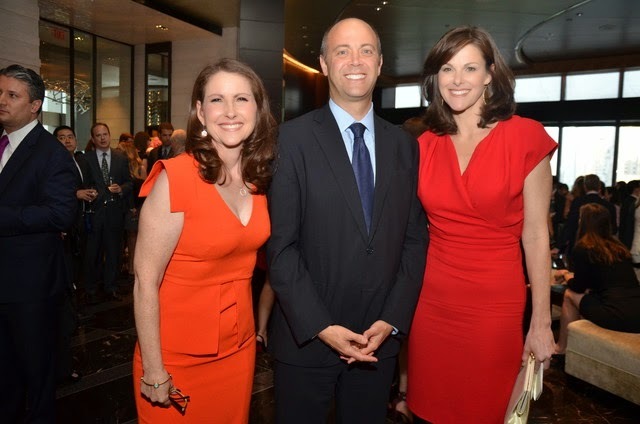 Gureghian and his wife Danielle, who just happens to be CSMI's Executive Vice President and General Counsel, have contributed over $6,000 directly to Camden's own Senator Donald Norcross. 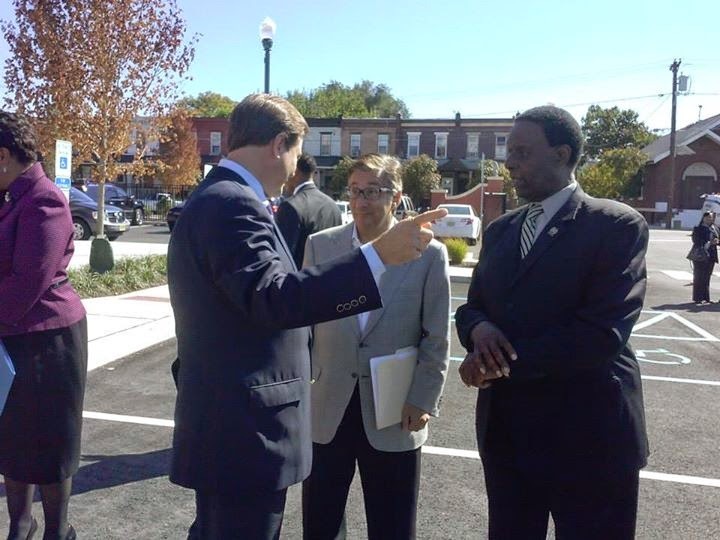 The October contribution of $1,000 came less than 2 weeks after the September 24th ribbon cutting for CCCS, which was attended by both Mr. Gureghian and Senator Norcross. Clearly Gureghian knows where to put his money to get things done in Camden. And guess who got almost $8,000 from Gureghian in 2013? The Senate and Assembly candidates from the 2nd Legislative District, which is, big surprise, Atlantic City. I wonder why a lawyer from Pennsylvania would want to donate to the campaign of politicians in Atlantic City? A May 2013 report from Press of Atlantic City reporter Diane D'Amico, who clearly seems to get that something very fishy is going on with CSMI in Atlantic City, provides the trail of breadcrumbs. The Casino Reinvestment Development Authority on Tuesday approved plans to negotiate a lease agreement with Atlantic City Community Charter School in a move officials said was intended to allow the new school to open by September. And who has lots and lots of dealing with the Casino Reinvestment Development Authority (CRDA)? Why, that would be Senator Whelan (for example, here, here and here). But see, the trouble was there was already a charter school in the space the CRDA was looking to lease to CSMI. 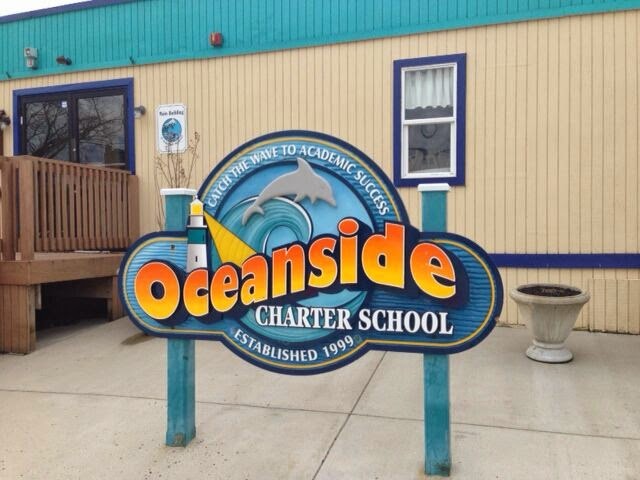 Luckily for CSMI, Oceanside Charter School was abruptly closed in June, 2013. Again, D'Amico has the story. The school will officially close at the end of the month after the state Department of Education did not renew its charter this year. Just a few blocks away, at the All Wars Memorial Building, representatives of the brand new Atlantic City Community Charter School, or ACCCS, rushed to enroll enough students to meet the state requirement of having 90 percent of its proposed enrollment of 150 students in grades K-5, in place by June 30. If it gets final state approval in July, the new school, managed by CSMI Education Management in Chester, Pa., will open in September at Oceanside’s site. Anyone else conjuring up images of vultures circling over Oceanside? Back in D'Amico's May report, it could not have been more clear that ACCCS was poised and ready to swoop in and take over Oceanside. Gureghian actually had the temerity to contact the founder and lead administrator of Oceanside, Jeanine Middleton. Middleton said she also got a call Tuesday from Vahan Gureghian, founder and CEO of CSMI, saying he was interested in hiring some of her staff and also asking for her help in setting up a meeting with parents. Middleton said she will cooperate in the interest of the children. "This is a bitter pill," she said. "But I'll do what I can to be an advocate for the children and the staff." I've been researching and writing about charter issues in New Jersey for over three years now, and I have never read something this blatant. While there have certainly been other recent examples of well connected charter chains seemingly jumping in after a questionable recent closure of a mom and pop charter (see Camden's City Invisible Charter School and Newark's Greater Newark Charter School), this story really takes the cake. It defies logic to think that Oceanside was not closed so that ACCCS, controlled by politically connected and ridiculously loaded Gureghian, could swoop in and take its place. I can find no evidence that Oceanside was ever put on probation, making it's sudden closure after 14 years in operation all the more perplexing, especially when the evidence to support the closure offered up by the DOE was so weak. Officials from Oceanside say that new renewal requirements were put into place last July that now compare Atlantic City's charter schools' test results to all of Atlantic City's public schools. Middleton said that in her renewal application her school outperformed many of the public schools from the areas that her students live, but that Oceanside does not perform better than the Atlantic City School District as a whole. Middleton explained, "Suddenly when we're 10 to 15 percentage points above...we are no longer. We are now a percentage point or two below them, as a district." What complete and utter poppycock. Ultimately, even though ACCCS pretty much had a school full of kids handed to them on a silver platter, they were not able to generate sufficient enrollment to open in 2013. Yet somehow, here they are in 2014, poised and ready to "Do AC" in September, after three full years of being unable to open. I don't know about you, but I'm disgusted. It's abhorrent that this DOE has invited a for-profit CMO that considers its business practices a "trade secret" and "confidential information" to make a profit on the backs of the most vulnerable children in this state. I would never stand by and watch as the likes of Gureghian opened a charter in my town, so how can we sit by and watch it happen in Camden and Atlantic City? We need to demand a full investigation of Gureghian's connections to politicians and officials in the NJDOE, and complete and utter transparency regarding his involvement in and operations of the charters in Camden and Atlantic City. Anything less is a travesty.